The Riverhead stop was at Peconic Ave. and Main Street, The Westhampton Beach stop was at Main Street, and the East Moriches stop was at a local hardware store on Main Street. What was interesting was that during the weekday the route ended at near 6 P.M, while on Saturday it didn't end until 11:15. 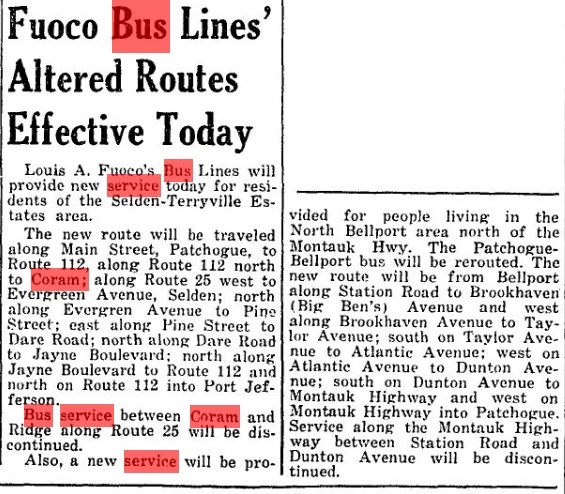 The Route also ran on Sundays Afternoons with a trip going from East Moriches at around one o' clock to Riverhead then back to West Hampton Beach; then about 4:30 going from Westhampton Beach to Riverhead then back to East Moriches. 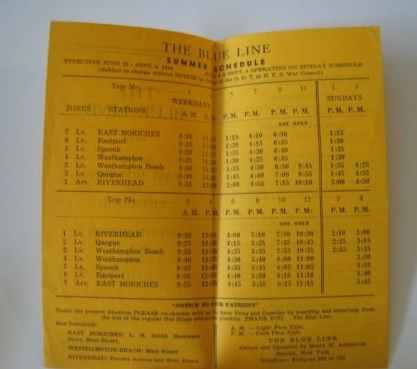 I found for sale on Ebay a 1971 bus schedule from Babylon Transit. The route went from the Abraham & Strauss Department Store in the Great South Bay Shopping Center to the Pine Aire LIRR Station. The section of route to the Pine Aire LIRR station seems like it could be part of what is today the S27. 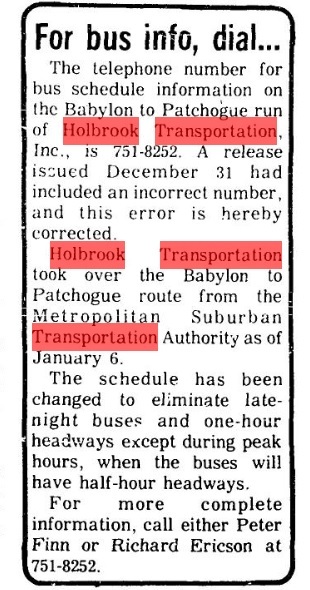 Found some historical newspaper cliping about Four Seasons Coach Lines/Holbrook Transportation. The First is about who won the bid to operate the route, which was Alert Coach Lines. 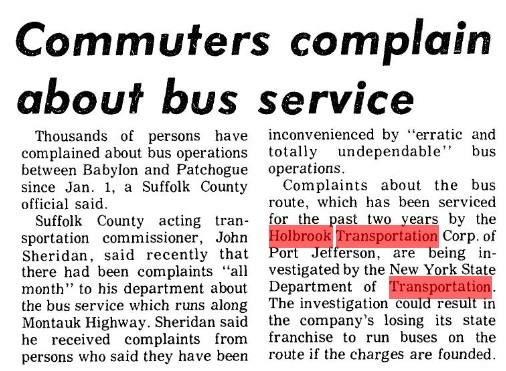 The Second is an Editorial from June 1977 about how bad the bus service was. 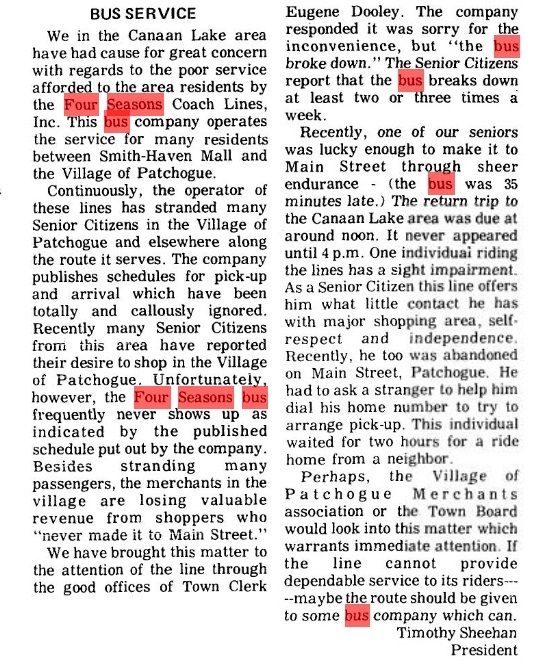 Here is an article from the Islip Bulletin from January 02, 1975 which talks about Holbrook Transportation taken over the Babylon to Patchouge route for no subsidies from the county after MSBA said they would stop operating the route four days later. Found this while searching. 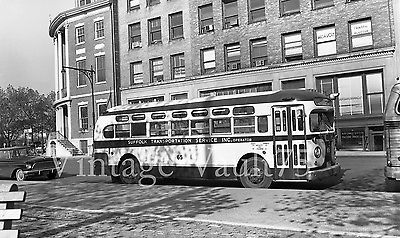 It's a photo of Suffolk Transportation Service #65. Unfortunately I couldn't find the source to find out where the photo was taken or the year it was taken, or even the make and model of the bus. Looks like it could be a GM TGH 3102. Oddly I was thinking the same thing, though I wasn't sure if I was thinking it because it was or I just wanted it to be a TGH 3102 because there happens to be a unknown numbered TGH 3102 on my roster for STS. Regarding the location of Suffolk Transportation Service #65: The historic James Watson House is behind it at 7 State Street, near South Ferry, Manhattan. I would not be surprised that the bus was on charter duty. Joe. Here are some more News articles. 1) From the January 16, 1975 issue of the The Long Island advance. 2) From the July 30, 1964 issue of the The Long Island Advance. 3) From the September 1, 1960 issue of the Patchogue Advance. 4) From the February 10, 1977 issue of the Long Island Advance. 5) From the February 24, 1977 issue of the Long Island advance. 6) From the July 13, 1978 issue of the The Long-Islander.